A new gas detector that senses dangerous exhaust and fuel fumes, then turns on integral warning lights and horns has been announced by Sensor Electronics of Minneapolis. The self-contained detector can sense a wide range of toxic or flammable gases, including carbon monoxide, gasoline, kerosene, jet fuel – even diesel. The rugged gas detector works in garages, engine test bays, loading docks, tunnels and parking ramps, even air intakes near parking lots. The unit can be mounted anywhere, plugged into a 110-volt outlet, goes right to work, ignoring dust, dirt, oil mist, aerosols, even nearby arc welding. Digital readout panels show explosive/toxic gas levels in LED or PPM. LED’s change from green to yellow to red as gas concentrations rise: At red the unit’s strobe light starts flashing and the horn starts blaring. The detector even watches over itself: Problems anywhere in the system turn on trouble lights that spell out what’s wrong where. 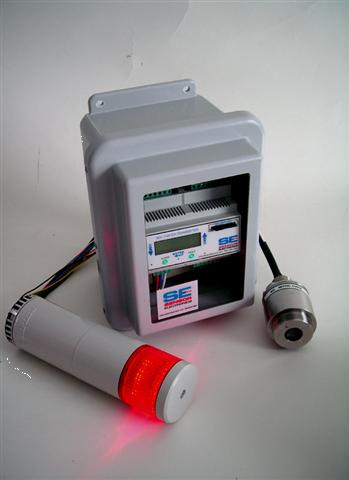 More information about this new detector with built-in alarm light and horn that warns of dangerous fuel/exhaust fume levels is available from Sensor Electronics, 5500 Lincoln Drive, Minneapolis, Minnesota 55436.